Synonyms: Pleuroridgea zanguebarica (Oliv.) Van Tiegh. Shrub or small deciduous tree. 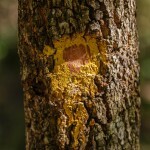 Bark very rough and corky, dark grey to black with bright yellow pigment, revealed when damaged. Leaves elliptic to obovate, 4-5 cm, glossy dark green above paler and dull green below, hairless, lateral veins fine and numerous at 45 degrees to the midrib; margin with very fine, gland-tipped teeth. Flowers in terminal, 2-4-flowered clusters, white to cream or pink, similar to Ochna flowers, showy but very short-lived. Fruit 1-3 small ovoid drupes, surrounded by the crimson, elongated, persistent calyx. Worldwide distribution: Kenya, Tanzania, Malawi, Mozambique, Zimbabwe. Burrows, J.E., Burrows, S.M., Lötter, M.C. & Schmidt, E. (2018). Trees and Shrubs Mozambique Publishing Print Matters (Pty), Cape Town. Page 598. (Includes a picture). Drummond, R.B. (1975). A list of trees, shrubs and woody climbers indigenous or naturalised in Rhodesia. Kirkia 10(1) Page 260. Robson, N.K.B. (1963). Ochnaceae Flora Zambesiaca 2(1) Pages 252 - 254. (Includes a picture). Strugnell, A.M. (2006). A Checklist of the Spermatophytes of Mount Mulanje, Malawi Scripta Botanica Belgica 34 National Botanic Garden of Belgium Page 127. Hyde, M.A., Wursten, B.T., Ballings, P. & Coates Palgrave, M. (2019). Flora of Zimbabwe: Species information: Brackenridgea zanguebarica.